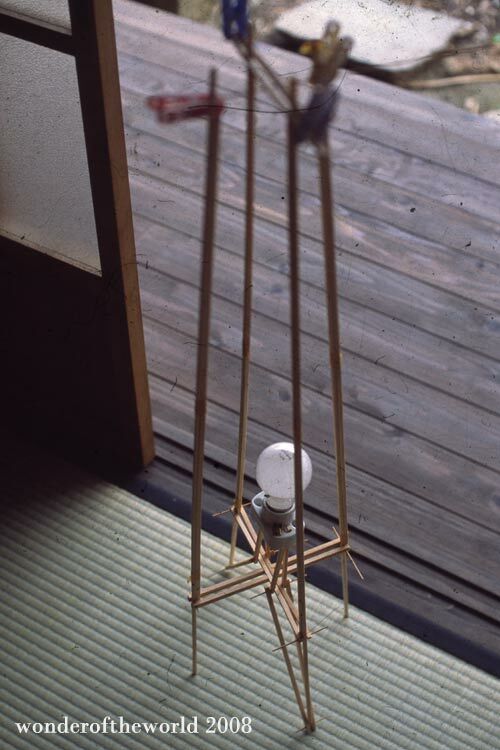 A prototype cage for a washi lantern using wooden rods from discarded airplane model kits found in the warehouse. 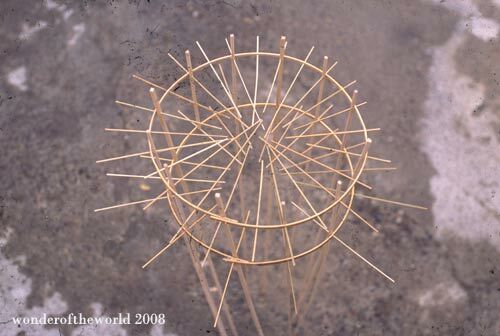 The working stages of a lamp which was eventually used in the lantern festival. It was constructed all together without using glue. 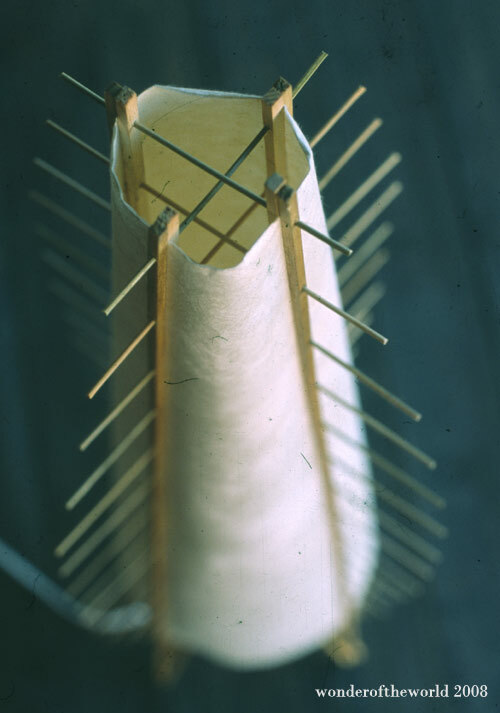 The paper shade was lined with a silver thread which is commonly used in Kimonos. There is a vast difference between machine made and handmade washi paper. At my first visit to the paper shops in Mino, I was simply fooled by the many imitations. Handmade paper can be detected by its natural beauty, texture and feel. The washi lantern on display at the Mino lantern festival in 2002. This lantern received a honorable mention as one of the twenty certificates awarded during the competition. 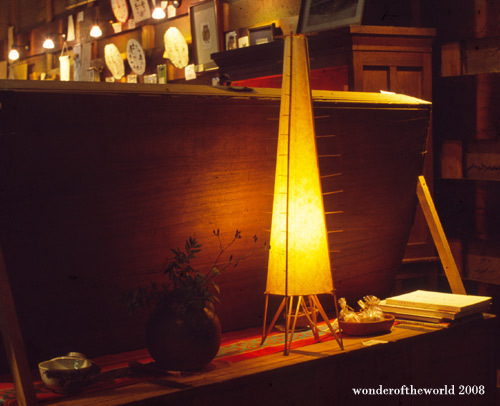 The lantern at a washi paper shop in Mino. It was a place the artists visited quite often for coffee. I think everyday. The detail of the lantern and the rods which supported the frame. 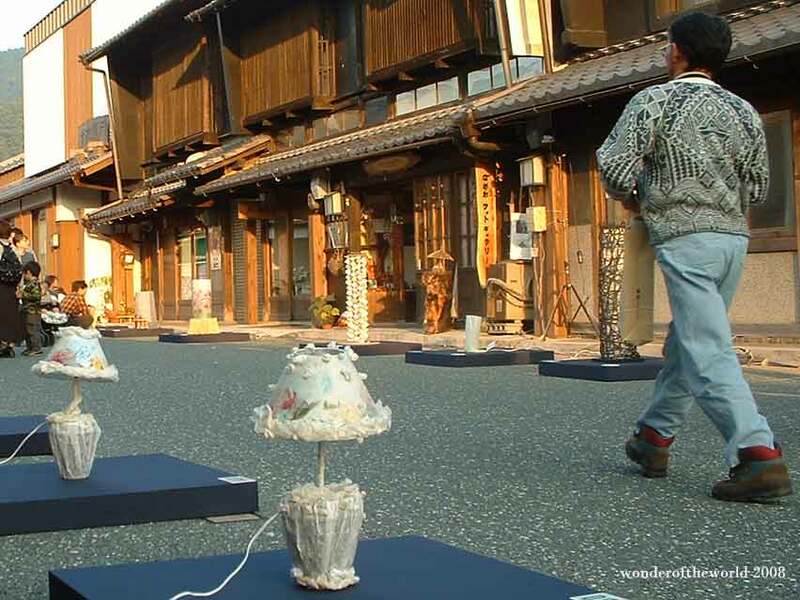 One of Mino’s annual festivals is the Washi Paper Lantern competition. Over 700 entries throughout Japan participate. The exhibition ranges from playful concepts to professionals who come up with innovative designs. The lantern festival draws a crowd of over 20 thousand people who stroll through the cross roads of the two narrow main streets.